• ±30 cm; Spread: ±20 cm. 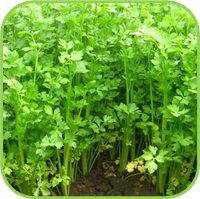 • Outside stems can be picked individually or the whole plant can be harvested when mature. 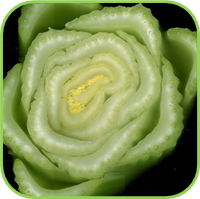 • Vegetables: Plant with Leek, Spinach, Tomato, Beans, Cabbage, Cauliflower, Onion. • Use as a salt substitute in a salt-free diet. Grind into a powder to use as an ingredient of celery salt. • Ideal snack for weight loss as it contains a few calories and is a good source of fiber, vitamins, and minerals. The diuretic property relieves water retention problems. It stimulates the thyroid, therefore increasing the metabolism to burn more calories. • Sedative action, due to the high Calcium content. • Stimulates the thyroid and pituitary glands. • Alterative - blood purifier. • Useful in treating high blood pressure. • Useful in treatment of liver conditions, tonic. 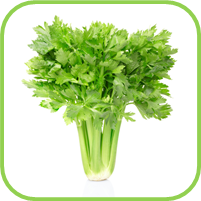 • Celery seed has been traditionally used in the treatment of rheumatism, arthritis, and gout. • It is a diuretic and helps eliminate acidic metabolites through the kidneys, act as an anti-inflammatory, and relieve muscle spasms, cramps and pains (antispasmodic action). • 1 to 2 teaspoons crushed seeds in a cup of boiling water, drink three times a day. • 2-4 ml of tincture made from seed, three times a day. • The seeds should not be used during pregnancy, nor should large amounts of the herb. • Cabbage maggot and moth.